Life. Life lately has been real good. I feel like everyday is like this constant holiday FUN day. Thanksgiving we had lots of family in town and everyday we had some new exciting adventure that I'm sure I will get around to posting. I'm busy having too much fun to post. That's the point, right? To live life in a way that is so fun that you want to blog about it? There is something about the holiday season that makes me giddy like a schoolgirl. I honestly can't think of a cooler time to have a baby. It's fun to be able to show Riggins Christmas tree lights and all that jazz. It makes me want to have better family traditions and to make things as memorable as I can for our little guy. I'm struggling on coming up with the traditions I want to keep. I have ideas and then I shoo them away for some reason. Maybe I don't follow through with them out of laziness or just pure dumb ideas, but I really need to get some solidified real quick. Christmas ain't waiting for nobody and I don't have that much time to set our family TRADITIONS! 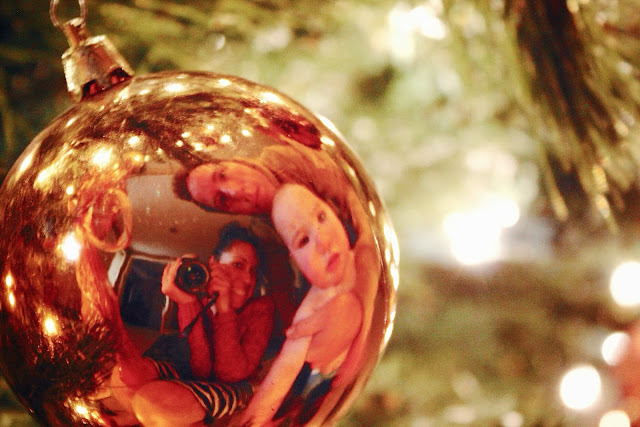 I think I'll start by making our first tradition of taking a picture every year in an ornament. Maybe one day my family will be too big to fit in one:) Anybody have an holiday TRADITIONS they want to share with me? 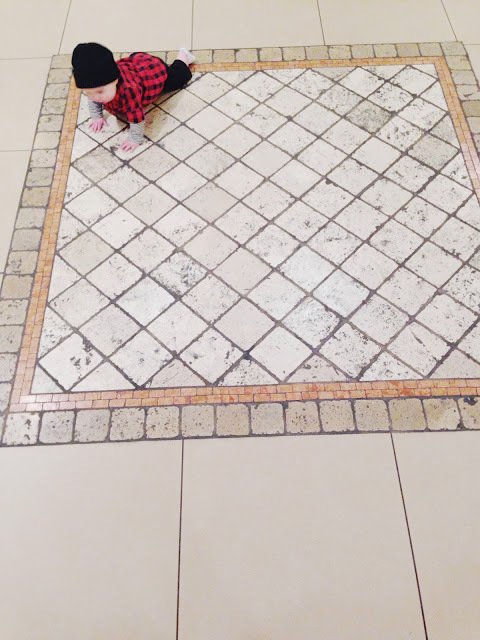 Anddddd...I have to document that we have a CRAWLER. Ah! He has been military crawling and doing the downward dog pose since 5 1/2 months, but the day he turned 6 months I think it all just clicked. He is crawling circles around me already! This mom thing is all the sudden getting real up in here. Wish me luck! Waffle Sunday...opening pajamas Christmas Eve...I actually need some more now that I think of it.